If you're looking to get in touch, then either stick up a comment on the relevant post in my blog, or email me here. If you're looking to train with me at my school in Bristol, head over to the website, Artemis BJJ. If you're selling a BJJ product and you would like me to review your gi, DVD, book etc, then I'd also be interested in hearing from you. Send it to me, and I guarantee an objective and thorough appraisal. If you're looking for an example, see my piece on Blue Belt Requirements. The full list of my numerous reviews can be found here. If you're looking to advertise on here, you can contact me to discuss the options. First come, first served. I initially used this blog as a way to review schools, way back when I headed down to my first MMA class in Bristol. I became a regular blogger once I began training Brazilian jiu jitsu at the Roger Gracie Academy in 2006, writing up every class in order to remember technique, track my progress and plan my goals for sparring. 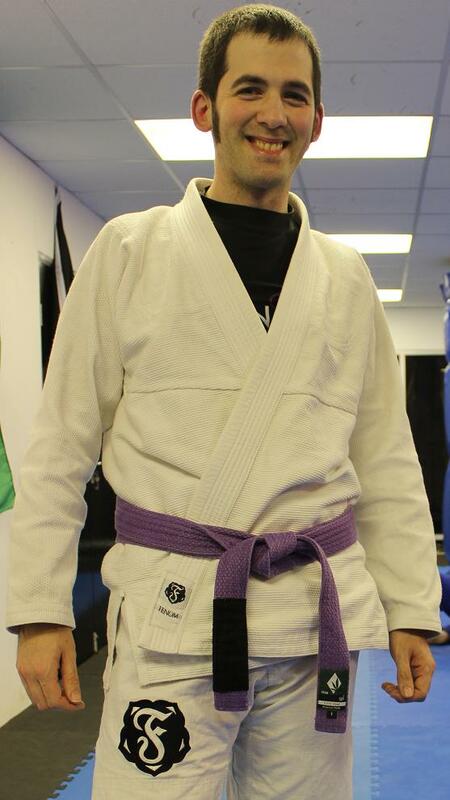 I received my blue belt from Jude Samuel in February 2008, and my purple belt from Roger Gracie and Kev Capel in March 2011. In writing this blog, I'm also hoping to get feedback from other BJJers - constructive comments on my training are always appreciated! I then started adding BJJ resources, like the BJJ glossary and technique summary in 2007, followed by the UK BJJ map, product reviews and an extensive BJJ Beginner FAQ in 2008. More recently, I've been trying my hand at articles, covering a variety of BJJ topics, along with interviews. I've also been using the blog to explore my interest in BJJ history. Please feel free to drop me a line if you've got any further sources (as long as it is something reputable I can reference and preferably link). You can read further examples of my writing in Jiu Jitsu Style magazine, to which I'm a regular contributor. I have several pieces in The Warwick Review, relating to poetry analysis. Online, my work has appeared on BJJ Legends, JiuJiuBJJ.com, MixedMartialArts.com, GiReviews.net, The Fightworks Podcast, BJJToday, Metamoris.com and GiFreak, along with various other sites. If for some reason you want to hear/read people interviewing me, you can find that on MixedMartialWorld.com (text) and the Fightworks Podcast (audio). I don't know if you received my first comment because my blog wasn't created yet. So I'll post my info. and question again jut to be sure. I am a 2 stripe white belt that has been training on and off for over 4 years now and have greatly lost my motivation to train. I earned my first two stripes at my first gym that I left a year and a half ago. I really enjoyed training at my current gym when I first started almost a year and a half ago. However, I have became burned out for a variety of reasons. I have always been the guy who goes to the gym once or twice a week, but I have only made it to my gym about three times total since 2017 started. I think my motivation comes from not being able to tap out blue belts, not being able to tap out too many white belts, still not having earned my last two stripes or blue belt, the feeling that I'm losing my ability to survive better during rolling, and having a torn rotator cuff that I injured long before bjj and will eventually need surgery on. Because of my injury, I never force an attack on anyone in rolling as I have to be careful not to dislocate it even though it does happen sometimes. I'm very limited of what I can do because of my injury. Since I started at my current gym, my head coach has told me twice that I roll well and am close to my last two stripes without me asking. The last time he said that was about 25 classes ago. I keep track of going to class and have a total of 143 days of rolling counting both gyms I've trained at. I have not seen my head coach for many months because he traveled to another state for a temporary high paying job and I don't know when he's returning. Since he left other high level coaches including the ones who trained him have been filling in for his spot and other students have been promoted. I'm not sure but maybe I would have been promoted earlier if I was more consistent. Some of the students I roll with who have been promoted to blue belt have told me that they feel I should be a blue belt already. Despite the craving I have for my final 2 stripes and blue belt, there was a time about 8 months ago when I was having a lot of trouble with newer white belts and even got tapped out in my own guard by one who had no previous background in grappling. I felt unbelievably disappointed in myself that day. I know that it's not unheard of for less experienced grapplers to tap out those with more experience and of higher rank, but getting caught like that from by a guy who only had 2 weeks of training was an extreme self let down. Although I have had much better moments since that day against blue belts and white belts, my progress has varied a lot. Overall I have lost a lot of enjoyment for the art, but at the same time I feel like I haven't reached the point to call quits just yet. Ultimately my main goal since day one has been and still is to have a solid defense and escapes so I can hold my own against other grapplers and untrained fighters. Many guys I roll with are usually impressed by my defense, but I feel like it's not good enough sometimes. My other goal is to earn my blue belt, but I would love to make it to purple someday especially before I leave for good. It would be great if I became a black belt one day, but I just don't see myself doing it forever as I have lost my drive and just want to have a better skill set and a belt to show for it. Of course I want to earn my belt promotions without them being handed to me. Please give me some feedback on what you would do in my position. Thank you for your time.